A $1.8 million, three-year grant will fund a research project led by Dr. Robert Cohen, clinical professor of environmental and occupational health sciences in the University of Illinois at Chicago School of Public Health, to determine why mine dust-related lung diseases, including progressive massive fibrosis and rapidly progressive pneumoconiosis, are on the rise. The grant is from the Alpha Foundation for the Improvement of Mine Safety and Health, Inc.
“We need to better understand the relationship between mine dust exposures and the recent increase in severe lung disease among miners in order to identify and mitigate risk factors,” said Cohen. 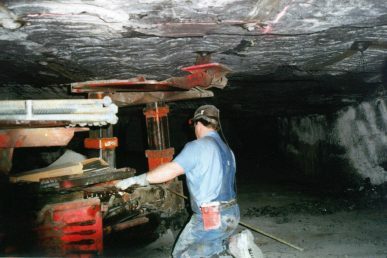 Progressive massive fibrosis, the most severe form of coal workers’ pneumoconiosis, occurs when masses of fibrotic tissue form in the lungs in response to coal dust or other mineral dusts. Rapidly progressive pneumoconiosis, also known as black lung disease, is caused by the accumulation of coal dust in the lungs. Both can cause severe respiratory distress, and many sufferers are placed on oxygen for the rest of their lives. Some patients may even require lung transplants. Following the enactment of the Federal Coal Mine Health and Safety Act in 1969 in the U.S., there was a decline in coal workers’ pneumoconiosis from 6.5 percent in the 1970s to a low of 2.1 percent in the 1990s. But data from the U.S. National Institute for Occupational Safety and Health shows that coal workers pneumoconiosis has increased to 3.1 percent in the 2000s, including the most severe forms of the disease. The research project will take a multidisciplinary approach, bringing together experts in mining engineering, mineral science, pulmonology, occupational medicine, pathology and epidemiology. “This is really the first study that will attempt to link mine dust exposure characteristics, clinical findings, pathology and lung dust characteristics to help identify the critical risk factors associated with the development of PMF and RPP,” said Cohen. The researchers hope that their findings will help in the development of interventions that can reduce these risks and help prevent disease. Cohen explains that most research on the recent increase in progressive massive fibrosis and rapidly progressive pneumoconiosis has focused on X-ray findings, but there is little in the scientific literature that identifies particular mineral dusts or characterizes their toxic effects on the lungs. Few existing studies take into account patients’ medical history, including whether a patient is also a smoker, or which mines they worked in, the types of minerals found in the mines and the amount of time the workers spent working in those mines. The researchers will examine biopsy, explant or autopsy lung tissue specimens from miners with progressive massive fibrosis and rapidly progressive pneumoconiosis. While the samples will come from all over the U.S., the majority are from miners who worked in central Appalachia and were collected within the last 10 years. Cohen and his colleagues hope to collect medical records and occupational and health history to go with at least 100 tissue samples. Some samples are already linked to medical records and x-rays, but for occupational histories associated with the workers from whom the samples were collected, the researchers will need to track down and interview the miners themselves, if still alive, or their relatives to try to piece together work histories. The researchers will compare these lung tissue samples with much older samples from the National Coal Workers’ Autopsy Study made available through the National Institute for Occupational Safety and Health. The majority of these samples were taken from coal miners after their deaths between 1970 and 1996. “The idea is to compare modern tissue samples with the historical samples to see if dust particulates have changed significantly in any way over time, and if that may be a contributing factor to the recent increase in disease,” said Cohen. The researchers will also collect dust samples from mines that are similar to the ones worked in by the miners whose tissue samples are being analyzed. The aim is to gather as much information about the type and size of particulates that make up the dust in these mines. The dust will be analyzed by mineralogists at the United States Geological Survey in Denver and SUNY Upstate Medical University in Syracuse New York. “One of our hypotheses is that mining technology has become much more sophisticated in the last few decades, and because of this, dust particles have become ever smaller,” said Cohen. These smaller particles may cause more serious disease faster, but he added that more work needed to be done to determine if this hypothesis is correct. Emily Sarver of Virginia Tech is a co-principal investigator on the grant. Co-investigators include Dr. Leonard Go and Kirsten Almberg of the University of Illinois at Chicago; Cigdem Keles of Virginia Tech, Dr. Cecile Rose of the University of Colorado School of Medicine, Dr. Jerrold Abraham and Dr. Soma Sanyal of SUNY Upstate Medical University; Geoff Plumlee and Heather Lowers, United States Geological Survey; Dr. Jill Murray, School of Public Health University of the Witwatersrand; Naseema Vorajee, National Institute for Occupational Health, Dr. Lee Petsonk, West Virginia University; Dr. Francis Green, and Dr. Angela Franko University of Calgary.